This is actually pretty nice sci-fi flick with some very decent special effects for the day. It’s more engrossing than gross even though some of the effects are gruesome. 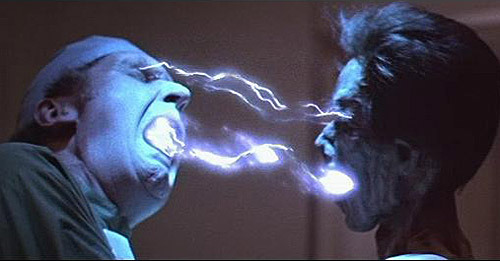 Before the CGI people took over, they did all the effects in a practical way and you can see the difference. It may look cheesy or cheap to modern standards, but it also looks way more realistic. The literary term I’d like to look at is Portmanteau…when you combine two words to create a completely new word. For example Smoke and Fog creating Smog. A wonderful place to see this technique at work is the poem “The Jabberwocky” by Lewis Carroll with words like “slithy”=lithe and slimy and “mimsy”=flimsy and miserable. A more modern word from science is “liger”=combination of lion and tiger. Guy on the right is Mick Jagger's brother in real life! 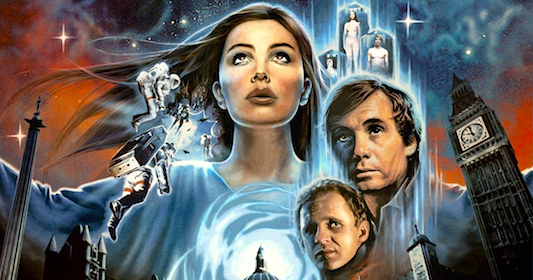 I feel Lifeforce is just that…a portmanteau of too many genres. I admire the attempt at combination to create something new, but like in jazz, fusion can sometimes lead to a whole lot of noise that people just won’t understand. This is a good movie, but I’m afraid it may be seen more as a joke by modern audiences. When you combine things to make something new.